You’re in a city with tons of sites to see. The whether is beautiful. There are landmarks all around. You can eat great food. You can go to a trendy microbrewery or sample expensive wines and pretend you can taste the hint of oak. Or, you can go to a museum and stare at old paintings or weird sculptures that you don’t understand. I’ll take the museum, especially if I can be by myself. Some indie music, my headphones, an art museum and a couple hours to burn are the makings for an afternoon of relaxation and inspiration for me. Artists invoking emotion were the original trolls on the internet. Paint-stained clothes were the original skinny jeans. Stylistic development was the original meme creation. Artist were hip before hipsters thought artists were hip. I took this photo of Mark Rothko’s No. 14 at the San Francisco Museum of Modern Art in 2012. I stood the allotted 18 inches from it and was overwhelmed by the piece. I had seen it many times in art history books, art publications and websites, but its beauty in person was shocking. The painting is about 9.5′ X 8.75′. The experience of investigating the piece is quite unique. First, you enter the room and your attention is grabbed by this monster. Then you’re drawn to it like a Kardashian to a camera. As you move in closer, more and more of your peripheral is consumed by the colors. Eventually, you’re standing directly in front of it, focusing on the brush strokes, on the blending of color and, at that point, questioning your existence altogether. 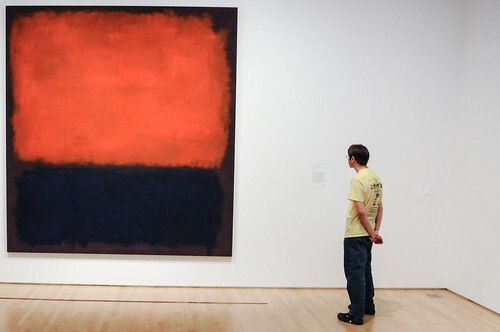 This Rothko consumes you, just like Cameron from Ferris Bueller’s Day Off was consumed by Seurat’s A Sunday on La Grande Jatte. See what I mean? Somewhere between gawking at the painting and thinking “I could have done this,” you start moving back away from the piece. Eventually, it dawns upon you that you just became part of the artwork. This is exactly the intent of the artist. In the photo I shot above, the guy pictured has made himself part of the artwork just as tens of thousands before him did the same. My relationship with God has followed the same pattern as my viewing of art. There are times that I am drawn in to a particular lesson, Scripture verse or sermon and I want to go deeper. I want to learn more. I want to do more. So, as my curiosity piques, I start to engulf myself more. I move closer and closer to God. I examine. I wonder. I absorb. I pray. Eventually, I move away. Now, I’m not saying that I physically move away from God or try to distance myself from his will in my life. Rather, I critique and analyze the lessons or revelations I just learned. I think I do a decent job of assessing what God is doing in my life. However, I think I do a relatively poor job of breaking down Scripture. In college, we were taught how to critique artwork. There were four fundamental steps that we can also apply to how we read Scripture and assess its meaning/application in our lives. Art – Who created it? What is it made of? What is the subject? What stands out? What are the colors? Scripture – What does this Scripture say? Who said it? When did this happen? Where did the events occur? What is the context? Scripture – Consider the themes of the passage. Was the intent to motivate, educate, warn or inspire? Is the passage positive or negative? Does it use metaphors or parables or reference other passages? Art – What is the purpose of the piece? What does the artwork mean to you? Why did the artist use certain materials? Scripture – Go deeper into the purpose of the passage. Look at other translations. Consider what some of the key words meant in Latin/Greek. Why was this written? Art – What is the meaning of the piece? Does it make you happy, angry, convicted, challenged, offended? Scripture – How can I apply the lessons of this passage to my life? How does this make me feel? This stuff is hard. I’m not about to pretend that I do this regularly. I frustrate myself with the amount of time I don’t spend digging in to Scripture. I assume that I understand the concepts when I read a passage, but moments later I can’t remember any of it. It takes accountability to consistently analyze Scripture. It takes the willingness to put in your ear buds and isolate yourself for a period of time. I can only aspire to be engulfed in Scripture like I was with the Rothko painting or Cameron was with Seurat. I want to see each word for what its true purpose is in the passage just like I might consider each brush stroke in a painting.